RnB sensation Rihanna last night proved that her talent and beauty spans many industries including the World Food sector, as a campaign featuring the stunning singer romped home with a gong at the fourth annual World Food Awards. 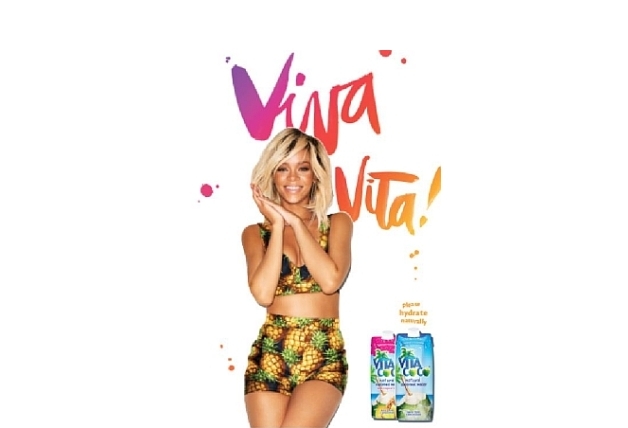 The Madonna and Demi Moore-backed coconut water company, Vita Coco received the highly coveted MEMS Marketing Campaign of the Year Award for their summer Viva Vita campaign which features brand ambassador Rihanna, at a glittering gala ceremony hosted by comedy legend Lenny Henry. High Street giant Tesco proved that despite the tough economic climate, they are still at the forefront of the ethnic food sector, receiving the Terre di San Vito National Retailer of the Year Award for the second year in a row. Celebrity chef and TV presenter Anjum Anand, in conjunction with The Spice Tailor, walked away with the Asda Best New Product of the Year Award for her unique range of authentic Indian sauces, which have been hailed as one of the most significant product innovations of the last decade in the world foods category. The Awards, now in their fourth year were created by the World Foods Association and recognise not only the incredible growth within the ethnic and world food sector, but also the diversity of cultures and communities that the industry is inspired by. The Awards are open exclusively to companies specialising, promoting or stocking products from the following countries: Asian, Oriental, African, Afro-Caribbean, European, East-European, Middle Eastern, South American and Mediterranean. The winner of the Rajah Restaurant of the Year Award, is true proof that the current explosion of Spanish tapas bars are giving other cuisines a run for their money. This year’s winner, Pizarro, is carving out an enviable niche in this competitive market. Owned and run by genial Spanish chef Jose Pizarro, it, is unquestionably the Spanish restaurant of the moment, located in one of the capital’s gastronomic hot spots. This year’s awards truly reflect the changing palates and increasing diversity of the ethnic food sector in the country. Mintels’s most recent report on ethnic foods indicated that although Asian and Chinese foods remain at the top of the food mountain, Mexican food is the new cuisine in favour with consumers. The Pudliszki Best Packaging of the Year Award was presented to The Perfect Fajita Kit by Discovery Foods, for their introduction of a highly innovative and original packaging design that had never been seen before in the Mexican category. The Perfect Fajita Kit by Discovery Foods has been designed for maximum convenience and minimum space, with each kit containing a sachet of seasoning mix, a condiment and eight super-soft Tortillas to make the perfect fajita. Fukhera Khalid, owner of Elbrook Cash & Carry and Indian restaurant Chak 89, showed that his business acumen and incredible work ethic are truly justified as he received the Star Network Entrepreneur of the Year Award. Mr Khalidâ€™s Chak 89 brand began life as a simple restaurant in Mitcham, Surrey, but has fast become a favourite haunt of Bollywood stars including the legendary Shah Rukh Khan. 2012 has seen Chak 89 become a household name, as it entered the retail market with Asda launching a range of take-away outlets in selected stores. Businessman, philanthropist and torch-bearer for organic foods Tony Deep Wouhra, MBE was honoured with the Jaguar Lifetime Achievement Award. Chairman and founder of East End Foods plc and now 70 years old, Mr Wouhra arrived in the UK from India at the age of 18 with just £3 in his pocket and a drive to save the fortunes of his family back home. He settled in Wolverhampton where he met his wife Barbara who helped him find a job as a door-to-door salesman, selling eggs to Asian housewives. It was his first foray into business and a love affair with food that would make East End Foods the powerhouse it is today. An ambassador for organic foods, Mr Wouhra has worked for the past sixteen years to produce food that contains as few chemicals as possible and his philosophy that food consumed by human beings should be as natural as possible has been the driving force to ensure that East End Foods has achieved the lowest level of pesticide residues in their products. Today, East End Foods is one of the largest importers of Indian food in the UK with an annual turnover in excess of £155 million. Host of the Awards for the third year, comedy legend Lenny Henry said of the winners and the industry that has inspired the Awards: “I love hosting the World Food Awards as every year they inspire me to try new and exciting cuisines and they really show how far we have come from the days of just Chicken Tikka Masala. The fourth annual World Food Awards featured a glittering array of celebrity guests including chefs Aldo Zilli, Silvena Rowe and Anjum Anand, as well as Reggae Reggae Sauce creator Levi Roots, actor Nitin Ganatra, Masterchef contestants and winners Liz McLarnon, Lisa Faulkner, Aaron Craze and Andy Oliver, TV food presenters Rob Billington and Ravinder Bhogal, and former member of boy band Blue, Antony Costa amongst a host of others. The World Food Awards 2012 will be broadcast on Star Plus to over 1 million viewers in the UK alone.